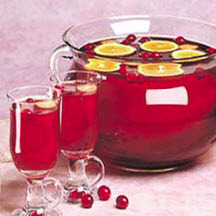 A spiced red wine and cranberry punch, optionally spiked with a lemon-flavored vodka, served warm in mugs with a garnish of dried cranberries and slivered almonds. Combine all ingredients except vodka, sweetened dried cranberries and almonds in a large saucepan. Heat to boiling, reduce heat and simmer 15 minutes. Strain punch to remove spices. Place 1 tablespoon sweetened dried cranberries and 1 1/2 teaspoons almonds in bottom of each punch glass or mug. Pour mulled wine over mixture.